No, no, no it isn’t!! Well, yes it is sometimes, but for loads of us camping makes a great way to reconnect with nature and to get the kids off their electronic devices. 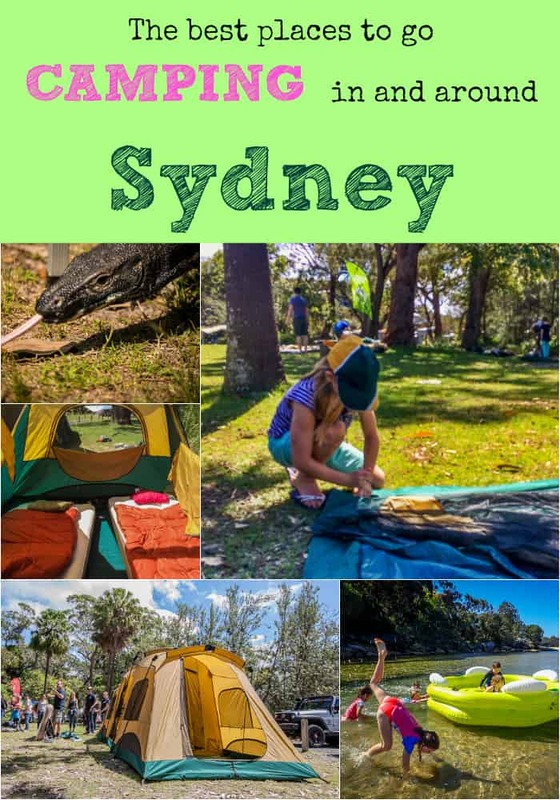 Here’s a list of great camp sites in and around Sydney, I keep on adding to it regularly, so do please let us know of other favourite places in the comments below. 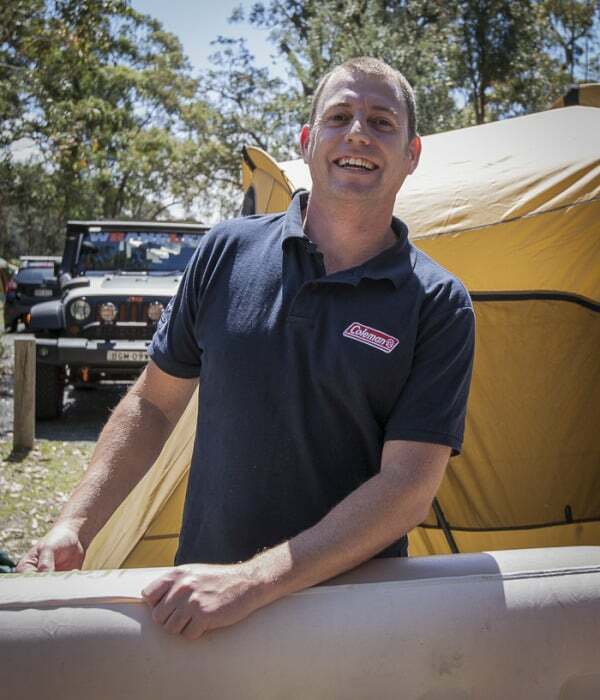 One of my first sources was Justin Casey the managing director of Coleman who knows a thing or two about camping. It’s part of his job description. Justin takes his family camping regularly and can highly recommend many sites. Then I’ve added to the list with a few more, my own faves and those of my friends and some Facebook pals too. This is quite a luxurious tourist park in Lane Cove National Park, it even has a swimming pool. There are caravan spaces and cabins there too. This extentive tourist park is at Narrabeen on Sydney’s Northern Beaches. 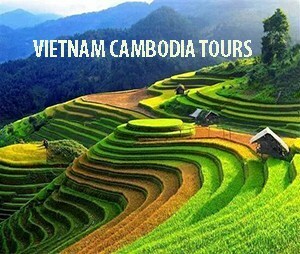 It has camping spots, caravan spaces and cabins too. It’s a walk away from beautiful North Narrabeen Rock Pool and the iconic surf beach. Read our blog post about camping at Narrabeen here. Check prices and availability NRMA Sydney Lakeside Park in Narrabeen here. 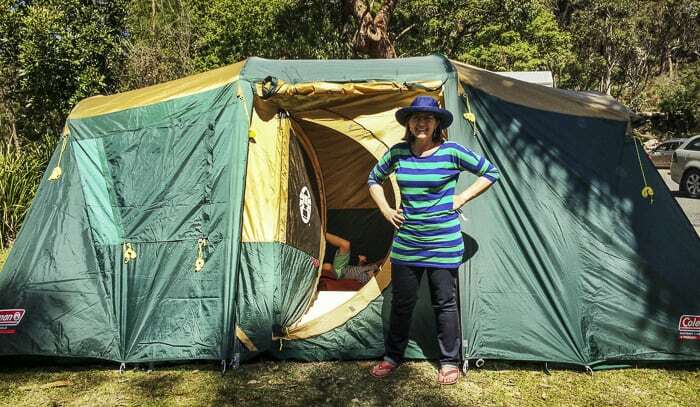 This waterfront campside is the only place you can camp in Ku-ring-gai Chase national Park. You have to catch the ferry from Palm Beach to get there. Read MrsDPlus3’s report on it on this blog here. Isn’t it great that you can camp in the middle of the Harbour? You can take your tent, or just bring sleeping bags etc and use the tents set up there. Check out all the accommodation options on this historic island. 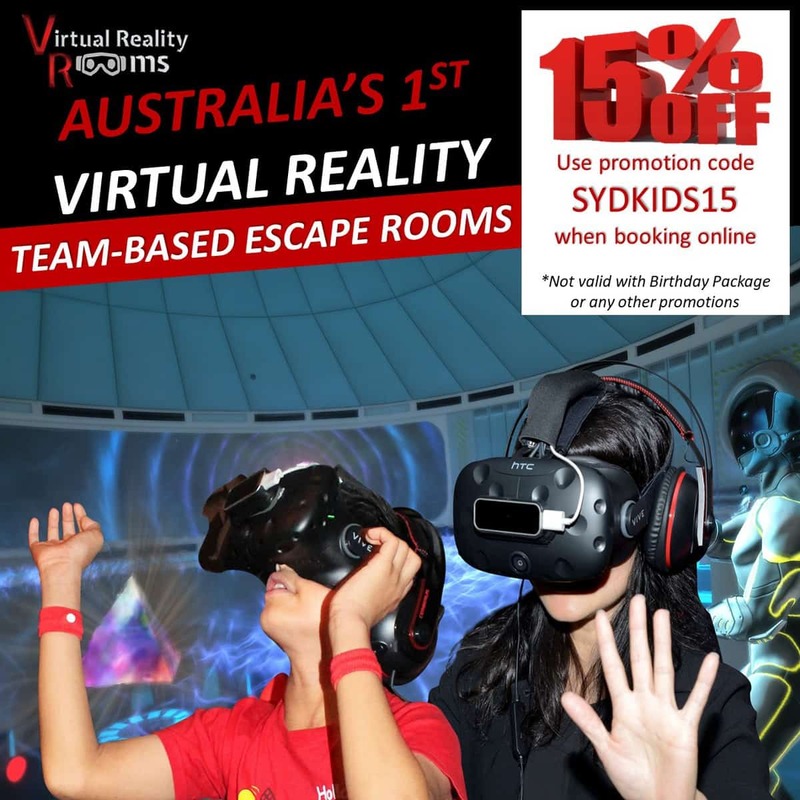 Check prices and availability at Cockatoo Island here. Right beside the Wollemi National Park, Upper Colo is very close to Sydney. It’s on the Colo river, is very inexpensive and you can light open fires. 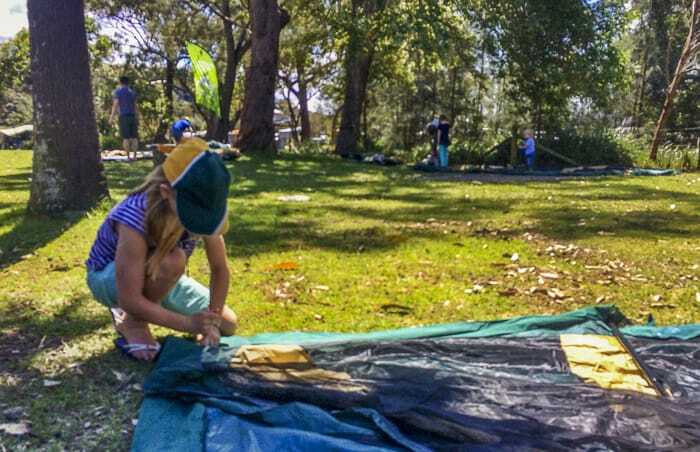 Just one and a half hours from central Sydney, this campsite has great amenities and riverside frontage, and comes highly recommended by watersports’ lovers. Check availability and pricing at Del Rio Riverside Resort here. Bush camping on the Shoalhaven River, near Nowra, about three hours south of Sydney. There are kid-friendly rapids on the river, they can whizz down in lilos and it’s safe for kids aged over five or so. It’s got open camping, meaning you pick your own site, and you can have open fires. Again, this campsite at the popular horse riding and outdoor adventure centre has a creek nearby. It’s just an hour north of Sydney, you can have open fires and enjoy the 3000 acre wilderness property. This is a free camping site, meaning it costs nothing and you cannot book ahead. It’s run by the National Parks and Wildlife Service. Read our post on Newnes Campground here. Just to the south of Sydney lies the huge Royal National Park. There are several campsites within the park. 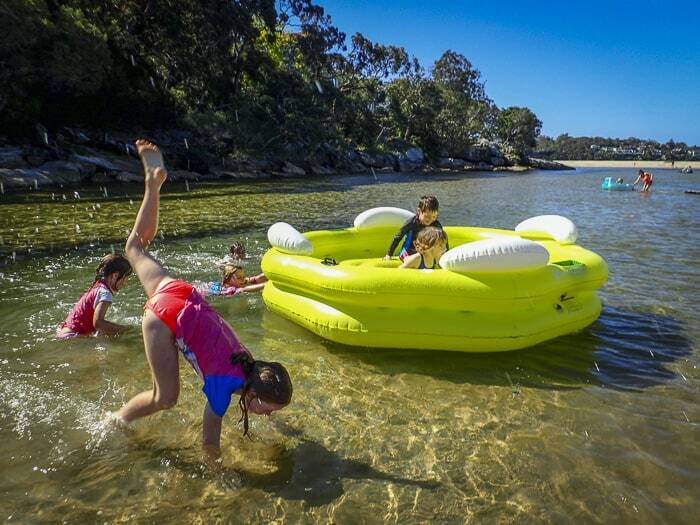 We stayed at Bonnie Vale, which is right on safe, calm water, great for the kids to play in. Gorgeous spot. Just a quick drive north from Sydney up on the central Coast is this council run website which a friend highly recommends. Within Booderee National Park is this much-loved camping area, right by the beautiful clear waters of Jervis Bay. 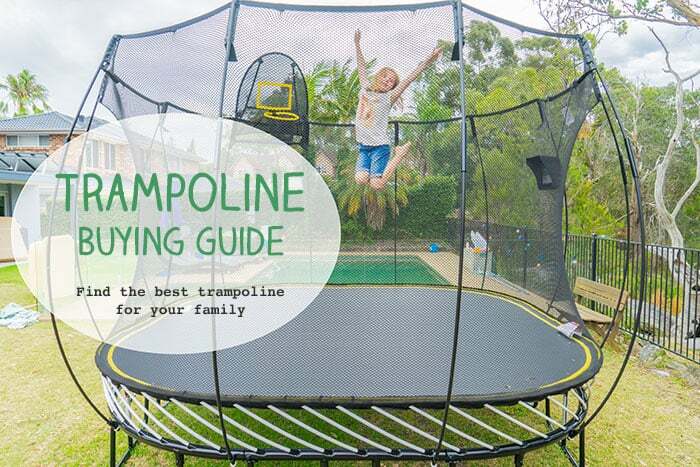 Very popular in school holidays. 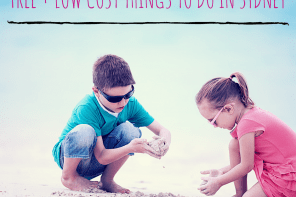 Heaps of ideas for things to do at Jervis Bay with kids on this post. In the beautiful Blue Mountains just a couple of hours from Sydney, this rural retreat has lots of camping space, and even some glamping available too. Read more about the camping equipment we recommend on this post: Gifts For Campers and Would-Be Campers. 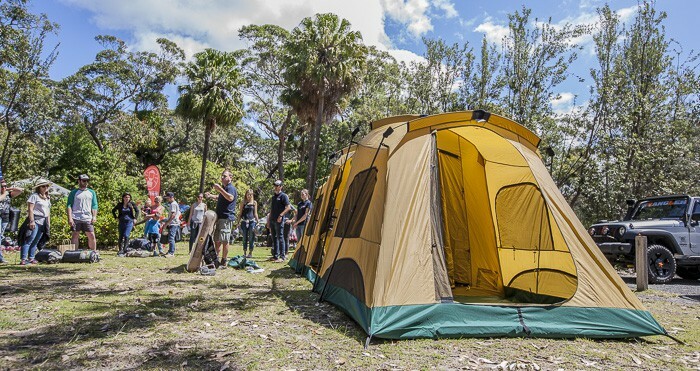 We’ll keep adding to this list of the best places to go camping in and around Sydney, so please do let us know of any favourite places we’ve missed. 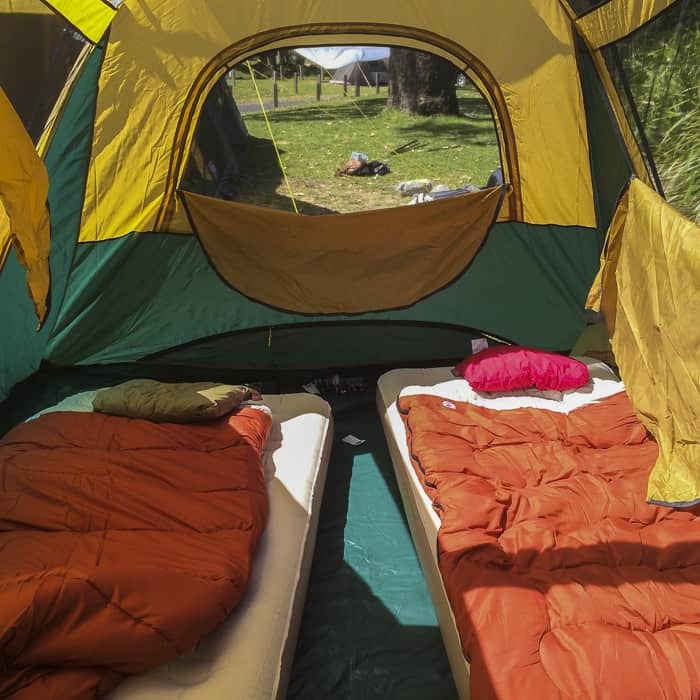 Where’s your family’s favourite camping spot? Go on, admit it, it’s the backyard! No seriously, please let others know of places you love, and we’ll catch you there. I’m telling you, Justin is the bloke to get the job done. There were quite a few people from Coleman looking after us, lugging watercraft around and giving advice on guy ropes. Ms 8 met lots of lovely little girls there and ran and ran and ran and played whilst I nattered to other people – fab. We love to camp at Cudgegong Waters Caravan Park on Windamere Dam. Take a boat and go fishing for yellow belly or be like us and take a sailing boat and enjoy lots of time on the water. 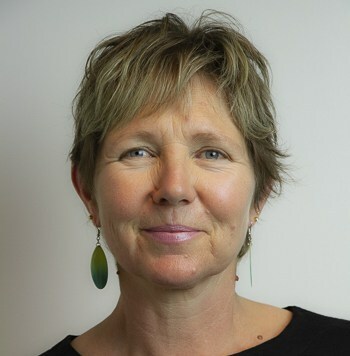 Lovely Lisa, I will have a Google around and find it tomorrow and add a link. I have already thought of another place I went to years ago that I must add. Thanks for stopping by, love hearing from readers. My husband is taking our 6 and 4 year old away camping this weekend with a bunch of mates … they are having a “Dad & kids” camping weekend. The three of them will sleep in the little Coleman 2 man tent my husband and I used before we had kids. I am totally jealous! Oh that does sound a good laugh. Where are they going to? Where did you used to go? I must find some old photos of my family in Scotland camping… in the rain. Lake Munmorah does some great activities in school holidays for the kids though. I did an aboriginal art activity with my daughter there a couple of years ago. That’s great info Linda, thank you. Enjoy your time alone… rare treat. 2 year old being left at home with me BUT somehow that feels very liberating … to only have one child to care for – LOL. We have grand adventured planned! Yes, one child is a holiday… my husband and eldest are away this weekend and Ms8 is having a sleepover, I’ll only really be chasing around with Mr8, such a treat. Here’s to the weekends ahead. I was delighted to link to the great post you did for this blog on The Basin. Do let me know when you post other camping stuff and I can add it to this post. I’m sure it will be rejuventated and updated a lot… and I will use it myself to refer to! Stand by for a great camping giveaway coming up. Great post! We were seriously considering camping at Cockatoo Island recently, but ended up making it a day trip to Sydney instead. But it looked like a great option. And we love camping! Cockatoo Island looks fantastic. 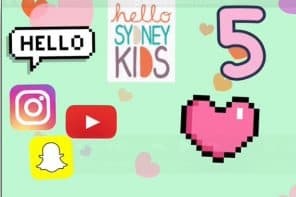 A day trip to Sydney!! Were you passing through when going somewhere else?? Mind you, I once did a ‘mystery flight’ day trip to Melbourne as a birthday present, found a great outdoor pool and did laps and relaxed… the days of very young hyper boys… it was well worth the long day for some lying down time. I love the house work comment from your friend. It may be, but I love the fact that the men do most of it. That looks fab and I will certainly be entering your giveaway, as i intend to do some more camping soon. Living so close to the Basin, we should do it more,as it really is a top spot. It really is, and yes my experience of camping is that dads do loads of ‘housework’ as it were, well spotted… shhhhh… say no more. You really are an AdventureMumma!! Great that you linked up your beach post. I was looking at your Instagram feed and loving the photos and ideas. Go the destination bloggy mamas. Wow, beautiful photos. Looks like a great camping spot! We love camping at Elanda Point up here in Queensland. It’s a really nice spot! Thanks for linking up with the Wanderlust linkup! Our next one is the 3rd December, so mark it in your calendar! We recently went camping at Bents Basin – it is about an hour from our house and 30 mins from Casula. It was our first camping experience and it was awesome. The basin is a great place to swim and the camp grounds were well set up! We loved it! I am a recent camping convert! We did our first camping trip ever last year with my mothers group to Bents Basin about an hour from Sydney. We had a ball – so much fun my daughter cried the whole way home as she did not want to leave!!!! 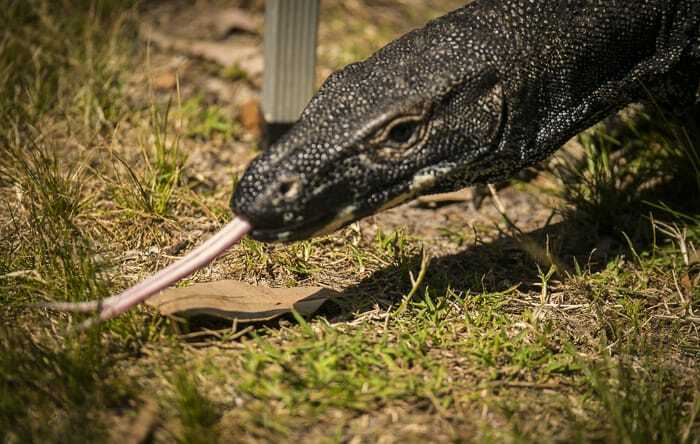 We are doing it all again in April with my mothers group at the Royal National Park. 12 adults, 11 kids and a stack of fun! Seana, my fondest memories are the whole family heading up to Patonga during extended breaks, its a great spot. This post was great, i think i’ll have to add the Upper Colo River to the list for one of our next trips away. We actually spent a week down at Green patch in early march, was amazing, the whitest sand you will ever see. 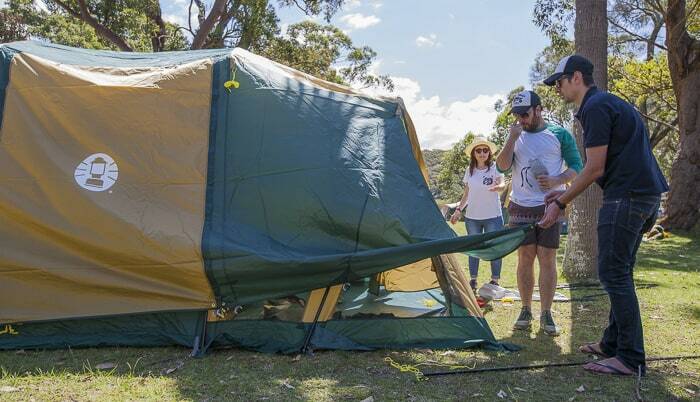 But you have to head to Newnes Campground, the best free camp spot just outside of Sydney. Thats our secret spot. Hi there, good to hear about it. Could you send me some photos?? Sure, not a problem! where do you want me to send them to? It really is a beautiful place. Great list, we shall definitely be referring to it next time we are up your way! Shall also make sure to have more time than we usually have in Sydney and surrounding areas too. I’ve pinned the article! Thanks for all the info. Excited to see the book of camping activities that you sent in your email today! Looking out for the giveaway post, but regardless, it’s going to be on the Christmas present list this year. 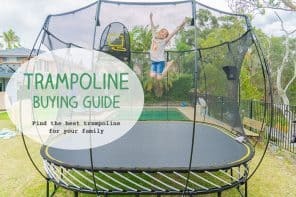 We love camping with our 3 year old daughter, and although we’re never at a loss of things to do, it’s great to get some new fun ideas!